In September 1792 the national emergency left little room for concern with the Crown Jewels. 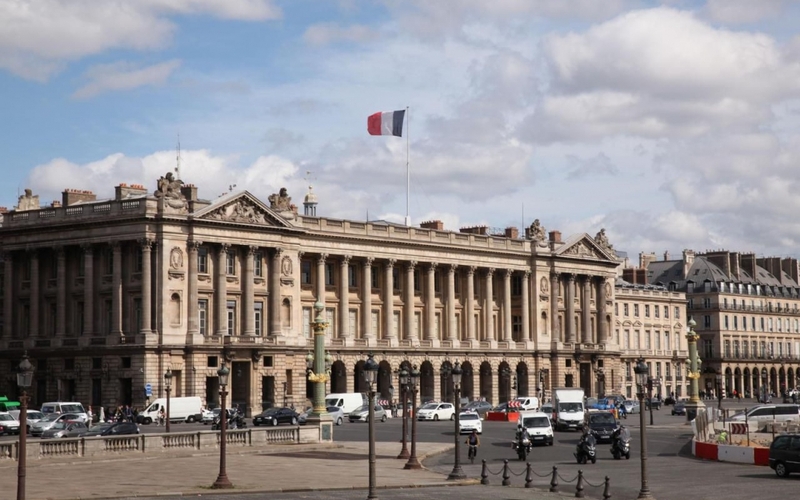 As recently as 16th August Cambon had proposed to the Legislative Assembly that they should be sold off to refloat the assignat. In theory they were safely under lock and key in the Garde-Meuble, situated in the place Louis XV, now the place de la Concorde. The building is the one which today houses the Ministre de la Marine. In the late eighteenth century this was still quite a remote location; the square was bordered by a ditch, and there was no lighting beyond the two lamps attached to the side of the Garde-Meuble itself. The longstanding intendant of the Garde-meuble Thierry de la Ville d'Avray, had recently been arrested and on 2nd September, he was murdered at the Abbaye prison. Roland appointed as his successor the painter Jean-Bernard Restout (son of the famous Jansenist artist). In the previous year Restout had been responsible for a 50-page inventory which had valued the Jewels at 24 million livres. The jewels were kept on the first floor of the building. They were stored in boxes in locked cabinets in a chamber which was also locked, bolted and secured with wax seals. However, their location was well known: until the recently, they had been laid out once a week for the public to view. Restout was very concerned about security; he wrote several letters to Santerre, the Commander in Chief of the National Guard and to Adjutant General Doucet to complain that he had only a dozen men, when he needed sixty. "Whether through negligence, forgetfulness, or deliberate malice" the guard was often left without relief for forty-eight or even sixty hours at a stretch. On the night of Sunday 16th September a patrol of National Guards in the rue Saint-Honoré heard the noise of a disturbance at the Garde-Meuble. The officer in charge chanced to be Armand-Gaston Camus, the conservator of the National Archives. They arrived just in time to catch the last two thieves as they clambered down a rope attached to the nearby lamppost. Rather than give pursuit, Camus went round the building to rouse the caretaker, who in turn summoned Restout and his guards. They climbed the internal staircase and, finding the seals undisturbed, wasted further precious minutes deliberating what to do next. When they finally entered the room, they discovered that the jewellery cabinets were empty and the thieves long gone. The police finally arrived at about two in the morning and Roland, the Minister of the Interior appeared at about four. The next day, the Assembly was informed of the theft. The major gems - the Regent diamond, the Sancy, the Golden Fleece, the French blue - had all been stolen; only an estimated 500,000 livres worth of jewels remained. Nonetheless the Ministers seemed more concerned with supplementing the judiciary in charge of the affair than with catching the thieves who were at large. Roland responded to his critics by pointing out that he was responsible not only for the security of the Garde-Meuble, but for that of the entire nation. In the weeks which followed accusations and counter-accusations continued to fly. The two thieves who had been arrested - Jean-Jacques Chambon from Saint-Germain-en-Laye and an Italian calling himself Joseph Douligny - were sent to trial before the Criminal Tribunal. Other individuals were also later picked up. The judges hoped to uncover a Counter-Revolutionary plot or at least some political motivation, but they were disappointed: all that they discovered was an ambitious burglary. In La Force Miette recruited a band of ten or so fellow inmates including a certain Cadet Guillot, who was later joined by several robbers from his native Rouen. In the chaos of the September Massacres they were able to break gaol. Other individuals later associated themselves with the robbery - perhaps as many as fifty, drawn from different regions of France. On 11th September Miette, Guillot and their comrades made a first attempt on the Garde Meuble; they climbed onto a first-floor colonnade and made a hole in the windows with a glass cutter in order to gain entry. The heavy metal bars holding the shutters could not have been in place. Incredibly, they were able to proceed completely undetected. They could carry off only a few of the jewels, but two nights later they returned for a second attempt. This time there were perhaps a dozen thieves, under the direction of Meyrand "le Grand". It was probably on this occasion that the larger pieces, including the Regent and Sancy diamonds, were stolen. A third group took its turn on the 15th September. The thieves then met in a café owned by sieur Retour to divide the spoils. There were drunken arguments, which ended in Douligny suggesting that a fourth assault was required. By this time the thieves had become careless. When Camus and his men arrived on the night of the 16th the burglary resembled a party. Some fify people, men and women, were involved - some pretended to be National Guardsmen and sentries in the square, whilst others had entered the Garde-Meuble itself. 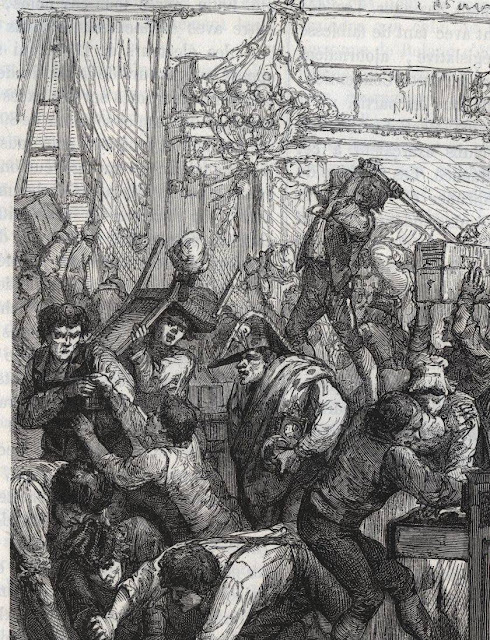 Valuable items - statues, swords and decorative bells - were tossed openly into the street, and in the room above the robbers lit candles,opened bottles of wine and feasted to celebrate their good fortune. Of the fifty or so individuals thought to have taken part in the theft, only seventeen were arrested and tried before the Criminal Tribunal. Five were acquitted and twelve condemned to death - though only five of these were actually executed (Louis Lyre, a cobbler called Picard and his mistress, Claude Cottet, Meyrand). The guillotine was set up outside the Garde-Meuble in what was now the place de la Révolution. The others - Douligny, Chambon, Badarel, Depeyron, Gallois, Mauger and Paul Miette - appealed successfully against the verdict and were sent to the tribunal at Beauvais, where their position was debated in May and June 1793. They admitted to the theft but denied that it was political incharacter. Away from the capital, with the national emergency passed, they were tried in a much calmer atmosphere. Miette, though the acknowledged ringleader, defended himself energetically, and even produced a printed memoir setting out contradictions of testimony against him. He and Mauger were eventually acquitted; the others had their sentence commuted to a term in prison. Douligny was subsequently pardoned and went to Brest. Other ringleaders, notably Cadet Guillot were never apprehended at all. Most of the larger gems were eventually found, thanks to confessions, police informers and at least one anonymous tip-off.. Some resurfaced almost immediately. One of the condemned men, Depeyron begged to be spared the scaffold in return for the surrender of his spoils; escorted to his home in a dead-end street called Sainte-Opportuné, he opened the roof window, reached out and handed back to the authorities a bag containing a number of prize gems - including the famous Hortensia and Grand Mazarin diamonds. A second stash was recovered in the allée des Veuves (avenue Montagine) where it had been buried by Badarel. The fabulous 13-caret Regent diamond was supposedly discovered in an attic. Other major diamonds - the Sancy and the Guise - were located in the house of a man named Tavenal. According to the 19th-century historian Germain Bapst, the magnificent parure known as the Toison d'Or , which included the great French Blue diamond, was taken by Cadet Guillot in the first robbery on 11 September. Guillot immediately left Paris with his fellow thieves from Rouen, two of whom, Salles and Fleury-Dumoutier, were later arrested. He then went on to Le Havre and London. He was reported to have shown the jewels in a Moroccan leather case. At some point the Toison d'Or was broken up and the diamonds sold. In 1796 Guillot returned to the Continent but fell foul of one of his fellow-conspirators and was consigned to a debtors' prison. The French Blue was never recovered. The trials were replete with charges and countercharges. One prosecutor accused Marie-Antoinette of conspiring to regain her jewels. Marat discerned a counter-revolutionary plot to undermine government finances. Danton himself was widely suspected of orchestrating the theft in order to bribe the Duke of Brunswick and secure peace. Madame Roland reports that she was visited by Fabre d'Eglantine, who was patently fishing to see if he was under suspicion. In her view the robbery could only have originated with "our master of audaciousness - I mean Danton himself". (Mémoires 1884, vol.2, p.140-41) Presumably Danton had deliberately allowed Miette and his co-conspirators the latitude to commit the robbery. Camus, too, was widely accused of negligence if not complicity in the crime. He penned his defence in a printed poster (Bapst p.466). According to this version of events, Danton then sent Westermann to the front with prior knowledge of the bribery plan. Tallien and Carra, were despatched by the Commune; Carra supposedly transported the stolen French Blue and other gems in his saddlebags. There is no documentary evidence for any of this. It seems highly unlikely that the richest prince in Germany would be open to any such bribe (and none is necessary to explain the Prussian withdrawal). In 1805 the Duke of Brunswick supposedly had the diamond recut and then took it with him when he fled to England in 1806 to join his daughter Caroline, the wife of George IV. The only slightly tempting piece of evidence is that Caroline's nephew, Duke Karle Friedrich, is known to have possessed a 13.75-caret blue diamond. This was widely thought to have been a piece of the French Blue, but recent research has disproved this. The Hope Diamond in the Smithsonian is now known definitely to have been cut from the French Blue and CAD reconstruction excludes the possibility of a sister stone of the required size. We are left therefore with the conclusion of Professor Gaby. There was no political conspiracy. The key to the great robbery lies in the extraordinary conditions created by the Revolution. In September 1792 Paris was in a state of dislocation where "everything was possible" - even, says Professor Gaby, the theft of the Crown Jewels by "une bande de Lulus". Richard Kurin, Hope diamond: the legendary history of a cursed gem, Smithsonian, 2017 (first published 2007)Chapter 8: "Stolen gems" is free to read on the Google Book preview. Germain Bapst, Histoire des joyaux de la couronne de France d'après des documents inédits (Paris, 1889) , p.447ff.